We are on the threshold of a frightening new era........ never before has humankind's abuse of the environment put the whole planet in danger. This is what Climate Change does. It has become the very greatest threat to our planet and everyone on it, besides all-out war with modern weapons of mass-destruction. The Greenhouse gases that cause climate change have a delayed effect, like a disease with a long incubation period. This means that we do not know how much irreversible damage we have done already - but we know that if we don't act now the effects will be many times more devestating still. The damage has been done mainly by the rich nations (which burn more fossil fuels like coal and oil, and so emit more CO2 - the main 'greenhouse gas') but the poorest will suffer worst and most immediately ...though everyone is threatened in the long run. People are dying from climate change now though it is not obvious since it is happening through a steady and unrelenting increase in the frequency and severity of the kind of 'natural' disasters (floods, droughts, hurricanes, wildfires, etc..) that we are used to1. Essentially this is because 'global warming' means an increase in the 'energy' in weather systems generally : that energy not only makes for an increase in temperatures : it also makes for more extreme and more violent weather. Furthermore the rate at which humankind is causing global temperatures to increase (and the climate to change) is much greater by far, than ever before while humankind has existed. And it will not neccessarily be a slow, steady increase : when we reach certain thresholds there could be very sudden changes ....and the whole process could accelerate and spin out of control in the nightmare of what scientists call "run-away climate change". So what 'global warming' and 'climate change' really mean is 'climate de-stabilisation' ....with the threat of total disruption of the global climate upon which every one of us depends upon for his or her existence. The vast areas of cold empty space that make up the vast bulk of the Universe are inhospitable to Life. Life is able to exist on the earth only thanks to its gossamer-thin protective covering - its atmosphere. And thanks to the fact that this atmosphere contains just the right amount of heat-trapping gases. So that our planet is not a desolate frigid lump like Mars or Pluto, or scorchingly, intolerably hot like Mercury or Venus. Now humankind is upsetting that precious and precarious equilibrium. This is down to the Industrial Revolution and the massively increased release of certain gases into the atmosphere that this brought about. 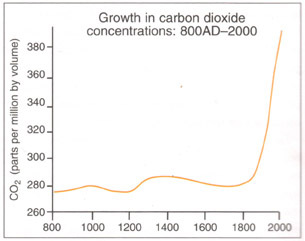 Most of all this was Carbon Dioxide produced by the burning of fossil fuels (coal, oil and gas formed from "fossilised" vegetation, buried beneath the earth's surface) but also included increased amounts of methane, nitrous oxide, and halocarbons. At the same time we have been cutting down trees - clearing forests - at an unprecedented rate. Trees, like most vegetation - and indeed 'life forms' - are largely made of carbon so their burning or rotting away releases what had been "stored" carbon, back into the atmosphere, as CO2. The result of this is that over the last 2 hundred years we have increased the amount of carbon in the atmosphere by about ONE THIRD. This is - already - a higher level than has ever been reached in the last 20 Million years....that's far longer than humankind or humanoid-type creatures have existed. So don't let anyone tell you : oh, we've seen this all before....in the seventeenth century there was a mini-ice age. What's happening now is on an infinitely greater scale than that.....we just haven't seen anything like all the effects feed through yet (that's frightening). Yes there have been changes that big, way, way, back in the geological record but they were always accompanied by a catastrophic impact on Life on Earth - as it at that time existed. This doesn't mention the increases in other 'greenhouse' gases. Altogether the rise in greenhouse gas concentrations is just beginning to feed through into actual climatic impacts. 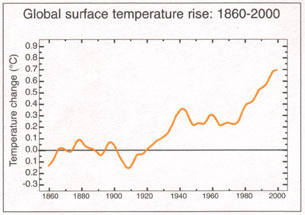 Global average surface temperature has risen by about 0.6°C in the last hundred years. This might not sound much but already the global 'physical' impacts have been considerable, including a 10% reduction in snow cover and a 40% decrease in the thickness of Arctic sea ice (at its seasonal thinnest). The 2000s were the warmest decade on record. How much are temperatures going to rise this century ? No-one really knows. The IPCC (Intergovernmental Panel on Climate Change) have suggested between 1.4 and 5.8°C. To understand what that means you have to bear in mind that the upper figure represents a 41% increase over todays global average temperature: it took just a 21% decrease to bring about the last ice age. Small temperature rises are more significant than they sound when you bear in mind the sensitivity of the earth's climatic systems. And in any case the Hadley Weather Centre has suggested a temperature rise of around 8.8°C2: this is, in effect, a really massive increase. Part of the reason they have come up with this bigger figure is that they have begun to take into account what are called "positive feedbacks". That means reactions in the biosphere triggered by rising temperatures, that cause them to rise yet faster. For instance there are huge 'stores' of carbon in forests or tundra permafrost that rising temperatures could cause to be released, thereby causing temperatures to rise yet higher again. A real frightener (not taken into account by the Hadley Centre) are the 'methane hydrates', crystal structures on the edges of continental shelves whch contain vast quantities of carbon (in the form of methane which is 20 times more powerful as a 'greenhouse gas' than CO2). If rising temperatures in the water or sediment around them caused the methane to be released the impact could be absolutely enormous. These factors could all bring about very sudden (and quite likely unpredictable) changes. It is not just a case of temperatures rising but whole climatic systems suddenly changing (like the possible 'switching off' of the Gulf Stream) We could be tipped into dire and irreversible situations on reaching certain thresholds. The cumulative effect would be "run-away" climate change that would render our planet uninhabitable. This word "uninhabitable" has not just sprung out of my own morbid imagination: its the one actually used by a British Secretary of State for the environment, Michael Meacher, MP. In the final analysis the really important figures to keep in mind are the ones about the background rise in carbon concentrations... the once-in-20 million year increase from which the effects can hardly be anything but very frightening indeed. It is as well to remember that not only has the consensus around the reality of human-induced climate change been consistently building but the seriousness of the impacts have consistently been revised in an upwards direction. Extrapolating on this basis just imagine what they will be predicting in 20 years time! Remember that while it may be possible to find at least one scientist to say more or less anything most of them do not prosper in their careers or gain respect from their colleagues by sticking their necks out and making statements that risk sounding outrageous. There is an inbuilt bias towards conservatism in the scientific/academic establishment: these frightening conclusions about climate change would never have surfaced in the way they have without something very, very, real behind them. And what is more their predictions are, for the most part, much more likely to err on the side of a cautious underestimate, than they are to overestimate, the scale of the climate change problem that we will have to face. Climate Change, then, is not 'just another' environmental problem. We have only been significantly aware of it for the last twenty or so years...in that time it has revolutionised the environmental debate, and magnified beyond measure the scale of the environmental threat. At one time talk of "Saving the Planet" was a rather meaningless slogan. Climate Change means that now its for real. But don't just take our word for any of this. Check out what other organisations say like the Royal Society. For an updated view on the gravity of the 'Climate Emergency' we are now facing see here. 1. “… in a world without deep emissions reductions, warming will kill many tropical forests in the second half of the twenty-first century, returning vast quantities of carbon to the atmosphere. This would run the risk of tipping the world into runaway global warming.” Jeremy Leggett, The Carbon War, 2001, p. 323. 2. “If today’s warming continues and deep-sea temperatures cross the threshold at which methane hydrates melt, huge amounts of methane could be released, triggering drastic global warming.” Jeff Hecht, New Scientist, 7 December 2002. 3. “If a qualitative climate change were to occur suddenly in the coming century—within less than 10 years—as has happened many times before in geological history, we may already have written our epitaph.” Jeremy Rifkin, President of the Foundation on Economic Trends in Washington DC, The Guardian, 1 March 2002. 4. “The ultimate concern is that if runaway global warming occurred, temperatures could spiral out of control and make our planet uninhabitable.... this is the first time that a species has been at risk of generating its own demise.… The dinosaurs dominated the earth for 160 million years. We are in danger of putting our future at risk after a mere quarter of a million years.” Michael Meacher, UK Minister for the Environment, The Guardian, 14 February 2003.